HOARDING EVERYTHING (AND I MEAN EVERYTHING!) | WHATEVER WAS I THINKING? There are many of you out there who have seen or experienced my selective hoarding and failed OCD behaviors. 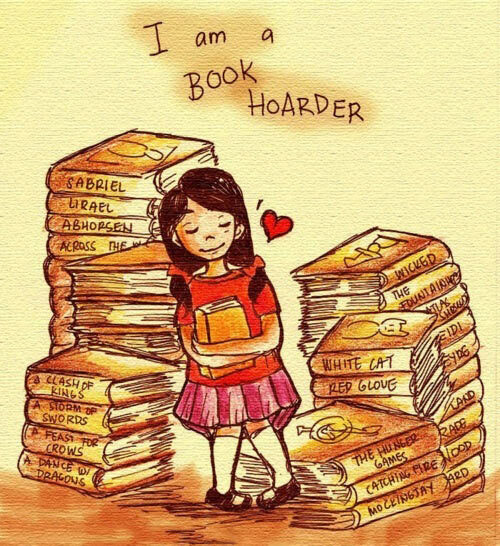 The one I am most comfortable admitting to is my book hoarding. There is also the tchotchkes that litter my home and show my eclectic interest in pigs, elephants, religious icons, kitchen “stuff” and the never to be forgotten dust. This morning Kim and I were using his day off to kick back and spend some relaxing time bopping around the internet. At one point, I said I wish they would invent something like a pair of glasses that could be used to manipulate the cursor on the computer screen eliminating the need for the physical manipulation through the mouse or keyboard. I know that something like that exists for the differently-abled population, but my needs would not require that degree of sophistication. Something like the soon to be discontinued Google glasses that would be cost-effective and allow me control the computer without wireless keyboard and wireless mouse. And here is where the hoarding raises its ugly head. The truth is that at this point in time I have 31 tabs up and running for the current session. I also have 27 file folders on the bookmark bar that allow me to over 200+ additional sites that I may have a need for immediate access at any given point in time. These folders include “BOOKS” with its four sub-folders and 24 sites, or “NEW” with one sub-folder and 34 sites and the one titled “ok” meaning I need to get to these sites before logging off and leaving them just hanging in cyberspace purgatory. Many have mocked me for this behavior (you know who you are.) Even I admit it’s ridiculous. I even found a kindred soul out there in webland with many of the same symptoms. waka waka waka knows of which I speak. He describes it thusly, “It’s the result of skittering about the Web reading items that contain links, opening the links for a moment in a new tab, and going back to what you were reading before or on to something else.” which hits the nail on the proverbial head. Now, for the desired wish of those “special” glasses. All of this “tab hoarding” would be unnecessary if, with the blink of an eye, pages could be read and closed without the wasted time of keyboard strokes or mouse clicking. Plus, as an added bonus, the prevention of carpal tunnel syndrome. So, get on with it you inventor friends of mine. I need to conserve energy and time so that I can use it for more meaningful activities. Like, not being forced into a sleep state because of energy wasted when a nod of the head would suffice or rearranging the hoarded books that I have glossed over so far.